Natalee Holloway | Sizzle: When The Media Sizzles, You'll Find It Here! You'll see it again--just not on a TV screen. Project Runway: The Bravo-Lifetime battle is over but you’ll still have to wait a few more months to see new episodes. The next season won’t air til August! Ashton Kutcher: Bringing back Punk’d. Sort of. A new version of the let’s-prank-people show will be released on the web. Maybe this is when he’ll ding-dong-ditch Ted Turner? Obama: Not sure how we feel about this magazine cover but some people are up in arms. To be fair, it’sprobably not how most people want to picture the president. Natalee Holloway: A television movie based on her disappearance gave the Lifetime Movie Network its best ratings ever. If only that would bring her back. Sigh. Blagojevich: Not so fast, Blago! After saying he’d appear on a crappy reality show, a judge has actually forbid him to do so. Pretty sure that makes us the winners here, right? STILL SIZZLING: This upper-class clothing store–named-dropped in everything from Clueless to Beverly Hills 90210–will be the subject of a Bravo reality show. He can handle terrorists but prison's a different story! Obama: If you name it, they will buy. Assuming you = Obama. After he referenced a book about FDR during his 60 Minutes interview, bookstores and buyers are scrambling to find out which book exactly it was. Obama Pt. 2: Does the First Lady’s body type make you wanna stand up and cheer? This writer does, giving praise to Michelle’s derriere. Newsstands: Speaking of butts, should they (as featured on raunchy mags) be prominently displayed on newsstands next to other more “respectable” publications? What ever happened to the First Amendment? Theme Songs: How much do they really matter? Apparently enough to warrant a top-40 countdown. TiVo: It’s the gift that keeps on giving! Soon you’ll be able to use it to order pizza! 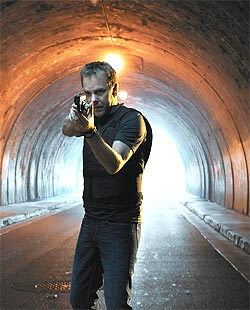 Kiefer Sutherland: One of the 24 star’s complaints about jail: no smoking. Oh, the horror! Lipstick Jungle: We thought it was canceled. Brooke Shields says no. Fans send lipstick to network. In sum: totally bizaarre. Fox News: They’ve set up a Facebook page. Totally uncool. Rihanna: Had 8 singles from on album on the Billboard charts! Ri-dic! GQ: Why have a man of the year when you can have MEN of the year? Leo, Phelps, Obama, and Mad Men’s John Hamm. Not too shabby. Mickey Mouse: We’re not sure if this makes us feel young or old. Mickey turned 80 today! Seth Rogen: He really likes making pornos. Zack and Miri was just the tip of the iceberg. Rogen is working on a new show for Showtime about…making pornos. Classy, as always. Dan Lyons: The Newsweek writer is having a hissy fit over the resignation of Yahoo’s CEO. Apparently Lyons, in an interview just last month, was told that wouldn’t be happening. It’s called spin, Lyons. You of all people should know about it. Robert Murdoch: Ouch! The media titan is blaming the industry’s decline not on the economy but the suckiness of editors and writers. Natalee Holloway: The case has been reopened. Maybe we’ll actually get answers–and closure for the family–this time around.